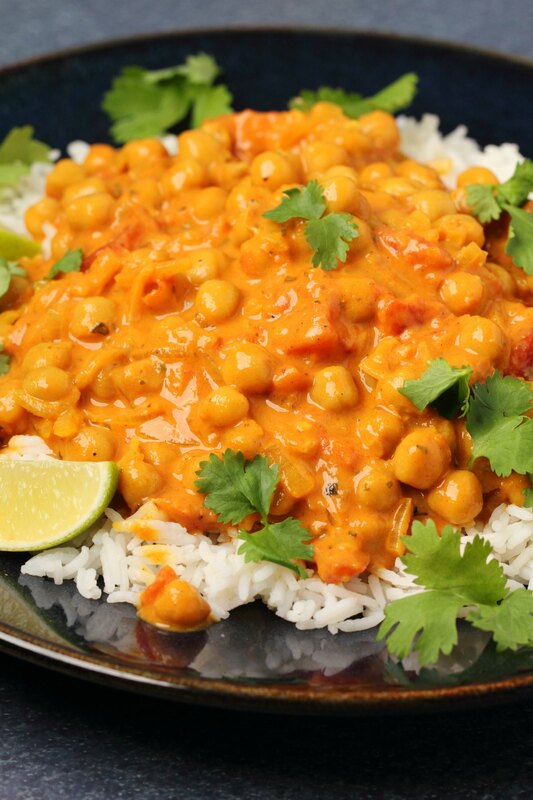 This delicious vegan chickpea curry is creamy and perfectly spiced. It’s also ready in less than 30-minutes and makes a wonderful weeknight meal. 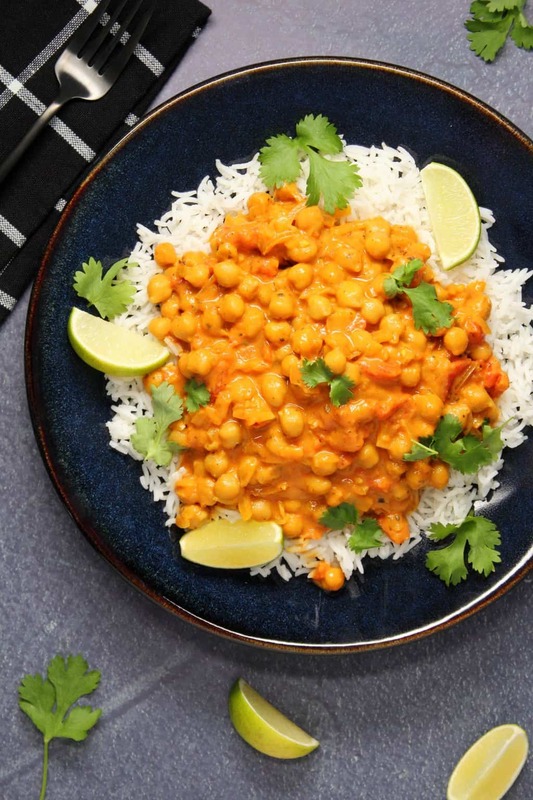 There’s always time for another vegan curry recipe and this vegan chickpea curry is all that and a bag of chips (translation: it’s divine!). 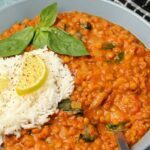 I was inspired by our vegan lentil curry to make this and it will definitely go onto the regular rotation from now on in our house. 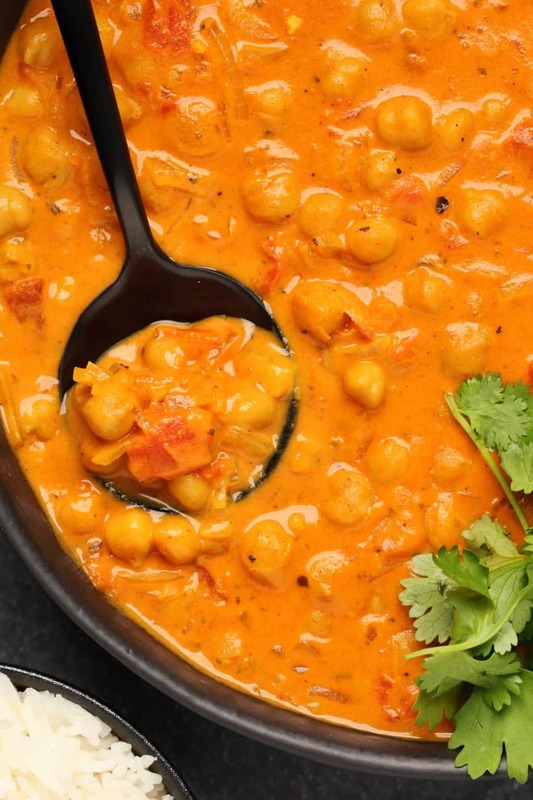 It’s a perfect mix of spices and flavors in a super creamy sauce. But the best part is that it’s ready in less than 30 minutes and pretty much flop proof! It is the perfect meal to make on a weeknight when you don’t have a lot of time but still want something really delicious to eat. It’s also high in protein and fiber and all that good stuff. Add some olive oil to a pot along with some chopped onions, crushed garlic, garam masala (or curry powder), cumin, coriander powder, turmeric and cayenne pepper and sauté until the onions are softened. 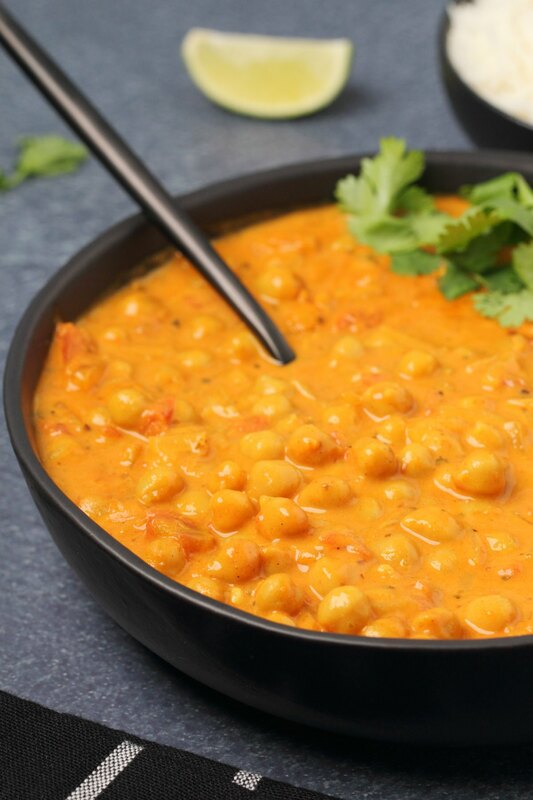 Then add in some canned chickpeas, chopped tomatoes and coconut milk and bring to a simmer. Then let it simmer for around 10 minutes or so until the flavors are really well blended. Add in a little coconut sugar for flavor balance and some salt and pepper as needed and that’s it! Serve with some basmati rice or cauliflower rice if you prefer, and some fresh cilantro and you have a beautiful meal. The spices really make this dish and I encourage you to use all of them. We used a garam masala powder but you can also use a curry powder. 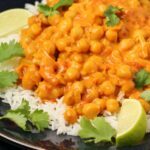 The cumin and coriander powder complement the garam masala perfectly while a dash of cayenne pepper adds a little extra heat and the turmeric adds a little color. 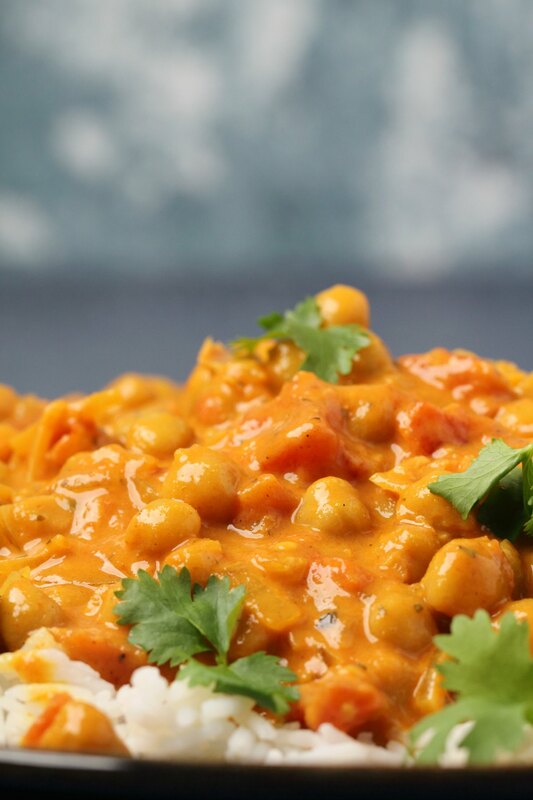 We used canned chickpeas and canned tomatoes which is why this recipe comes together so fast! 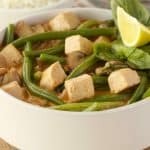 Full fat coconut milk provides the creaminess without overpowering the other flavors at all. 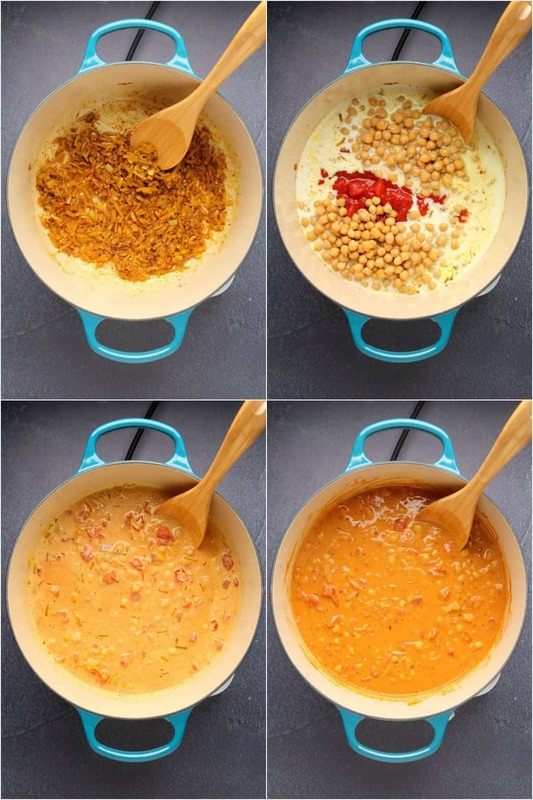 The result is a perfect blend that you will want to make many times over. Leftovers keep very well in the fridge and can be enjoyed over the next few days. 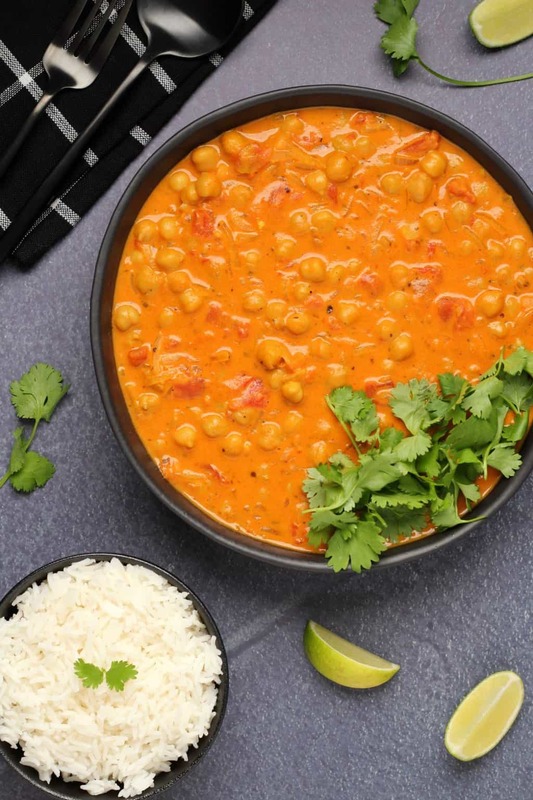 So let us know what you think of this vegan chickpea curry in the comments and please rate the recipe too. Thanks! 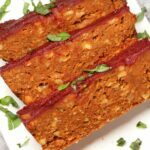 Sign up to our email list while you’re here and we’ll send you a gorgeous recipe ebook (entirely free) with 10 delicious vegan dinner recipes, and you’ll also be the first to know when new recipes are posted to the blog. Add the olive oil to a pot along with the chopped onions, crushed garlic, garam masala, cumin, coriander powder, turmeric and cayenne pepper and sauté until the onions are softened. 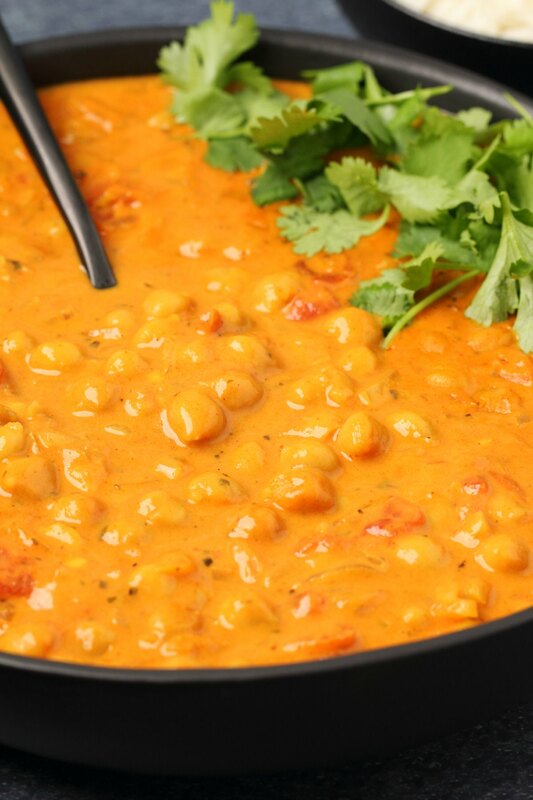 Add the chickpeas, chopped tomato and coconut milk and bring to a simmer. Let it simmer for around 10 minutes until the flavors are blended. Add coconut sugar and mix in. Add sea salt and black pepper to taste. Serve over basmati rice or cauliflower rice with some fresh cilantro. 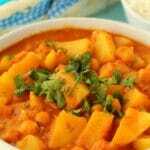 *You can use curry powder instead of garam masala. *You can use brown sugar instead of coconut sugar. *Nutritional information is for curry only and does not include rice. 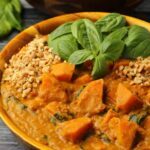 This recipe is delicious but I have recently entered a low saturated fat diet and was wondering whether there was a replacement for coconut milk. 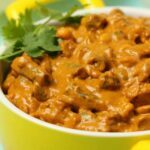 A really creamy, satisfying and savoury protein filler. I made this over the weekend and it’s absolutely delicious!! Looks lovely!! I’m assuming not but does the nutritional information include the rice? Cant wait to try this, looks so yummy. Would adding more veggies into this change the flavors too much? Any suggestions as to what might taste the best? I am diabetic and would probably skip the rice, so I would like to bulk up the serving with more veggies, other than just riced cauliflower. Thx! Hi Alison! Another delicious creation! I have made this recipe twice, and I just want to drink the juice the flavors are that incredible! I have a question about the recipe. Most of your recipes call for 1 onion. Is this referring to one white/Vidalia or 1 bunch of green onion? Usually I use 1/2 a Vidalia or 3 green onion stalks. Thanks for clarifying!